These were one of the best brownies I’ve ever had, they taste amazing. Unlike other cheaper and generic brands, this has a richer chocolate flavour without being too heavy for me. Adriando Zmbo brownie chocolate mix l always wanted to try and did when on special,l was very happy with the brownie’s and they tasted amazing! Our family found these delicious. Not too sweet but sweet enough to be a lovely treat. They were easy to cut up for lunchbox treats and weren’t crumbly. I found these to be just perfect. Not too sweet or sickly. My daughter is very picky when it comes to her brownies but she adores these one. So 2 thumbs up!!!!! I have eaten the ‘real deal’ and had some of Adrian Zumbo’s desserts and they are quite sensational. This brownie mix is pretty good when you need to be reminded of the incredible taste of his desserts. Yes every time! They are delicious! So much fun making them! As they are quick easy to make, tastes great and turns out right! Though, I found they seem to get harder and chewier by the day, so I like to zap them in the microwave for 20 seconds before I eat them. Still tastes great! I would normally keep in an airtight container for up to 1 week. Ive made these brownies since they first came out. The earlier version was better, and I preferred the chocolate bits in a separate package, so I would rate the earlier version 5/5, but having said that the most recent product always gets ‘best brownie ever’ comments. They are super simple to make, and I always keep a box in the pantry for those times I want to impress people. This mix was so easy to do. Instructions were clear. And the taste was so yummy. A perfect late night treat when the kids are in bed…so you don’t have to share. 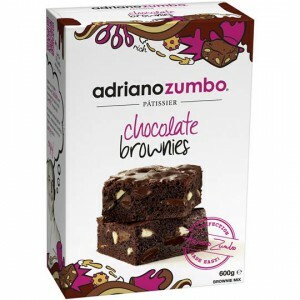 How would you rate Adriano Zumbo Brownie Mix Chocolate?